Our youngest son, Austin, began riding his bike without training wheels recently. He probably could have done it before now, but he wasn’t ready. We tried once and he decided that he preferred to have them on a little longer. And so I tried to teach him to balance so that neither training wheel touched the ground. But he wasn’t ready. Then one day, with trepidation… and maybe a little extra coaxing from me, he decided he would attempt it again. He rode across the driveway a few times with me doing to “the dad thing” of jogging along behind and holding the bike steady by the seat. I would occasionally let go. He did fine. But he still wasn’t sure he was ready. And yet I did not put the training wheels back on this time. The next day, the boys were outside playing and I walked out to find Austin riding his bike without training wheels pretty well. Alex had apparently coached him and he was making great progress. PR31 & I jumped into “let’s get this going” mode and soon Austin was riding all around the large area of our driveway. The more he rode, the better he got. The better his take-offs and stops. The better his balance. And his speed increased. Plus he was making tighter turns. He discovered that the training wheels, while helpful for awhile, were actually holding him back and slowing him down. In every new season of our lives, I’m not sure that we are ever completely ready… at least in our own minds. God may know we’re ready. Our family and friends may see that we are ready. But from our vantage point, we still want our “training wheels”… that which feels like it provides safety and security. So we put off taking away those precious training wheels because we are just not so sure that we can make it without them. But the truth is, God has new seasons for us in which we will no longer need those training wheels… those particular words of affirmation… that specific paycheck… that exact place to live. God has something wonderful for us, and those “training wheels” are only slowing us down, keeping us from being able to maneuver like we are capable of doing. 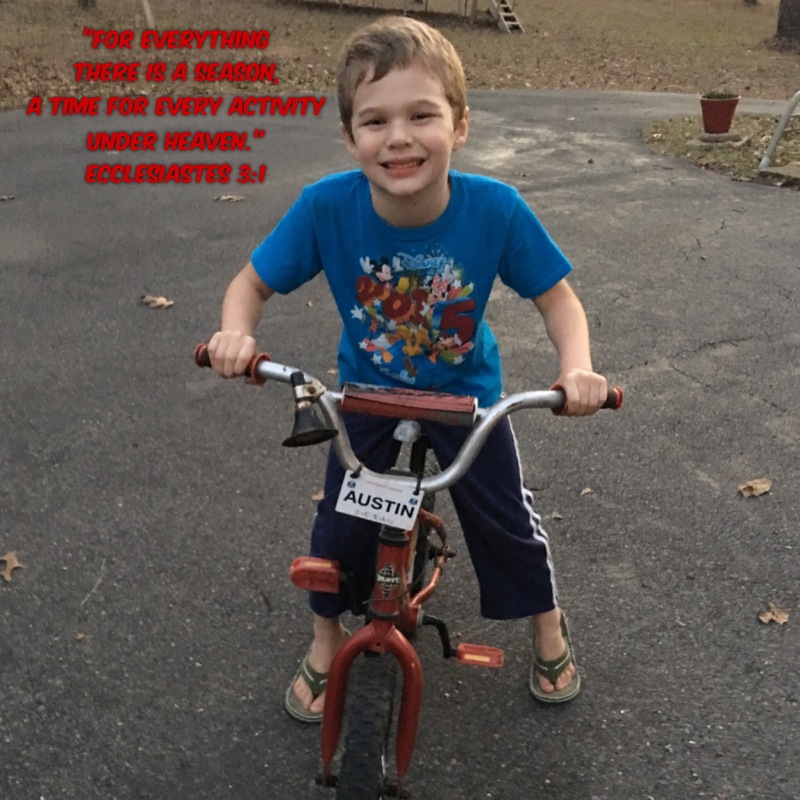 Solomon pointed out in Ecclesiastes 3:1 that there are seasons for everything in our lives. New seasons for new excitement and new enjoyment. Times of going slower and also times of going faster. It’s time to let God take off those “training wheels” which have given you security up to this point in life. Don’t worry, though, He’s not going to just send out there on your own. He’s going to be jogging along with you… with His strong hand holding the seat and steadying you so that you can learn the new balance and speed of life. Then, slowly, as He sees that you are learning, He will let His hand off a little at a time and just be nearby to catch you if you start to lean one way too much. And it won’t be long till you are out there riding at full speed… making hairpin turns… and power-sliding to a stop while He watches in sheer joy as His child enjoys newfound excitement, adventure and possibilities. So, shake off those nerves… trust your Heavenly Father… and ride like the wind!